FedEx’s electric-vehicle push took another step at the Hanover commercial vehicle show, with Nissan unveiling its all-electric compact van, the e-NV200 Concept, presently being tested by the global express transport firm. The FedEx-branded Nissan e-NV200 pure-electric concept as displayed at the IAA Commercial Vehicle International Motor Show in Hanover. Nissan has worked with FedEx since last December work-testing the vehicle in London and Yokohama, with testing planned to also take place in the United States, Singapore and Brazil. FedEx is nearing its 2020 vehicle fuel efficiency target ahead of time, it said last month, on release of its Global Citizenship Report. The report states that fuel efficiency gains have come from a focus on electric and hybrid electric propulsion. In the 2012 financial year, FedEx increased its global fleet of such vehicles 18 percent to 482, with 364 hybrids and 118 all-electric vehicles in service. "The fleet has logged almost 12.1 million miles (19.5 million km), saving approximately 345,000 gallons (1.3 million litres) of fuel," the report states. 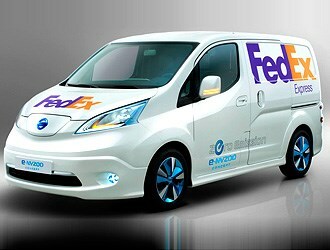 FedEx, along with rival UPS, has also been using the all-electric Newton Step Van from Smith Electric Vehicles. The Newton is in service with Frito-Lay in Boston and Coca-Cola in New York City. "We received significant interest from potential investors, however, we were unable to complete a transaction at a valuation or size that would be in the best interests of our company and its existing shareholders," CEO Bryan Hansel says. "We have instead elected to pursue private financing opportunities to support the execution of our business plan."